​We're celebrating our neighborhood and showcasing so many wonderful assets! We want to attract more terrific residents and fabulous businesses! Join us! Every resident is welcome to host a yard sale at their residence. Every business is welcome to attract new customers. Every institution is welcome to showcase the gifts they offer which make them a community asset. Noble and Oxford Elementary School PTAs are combining efforts again this year to kick off our neighborhood weekend with a family-fun festival. Come join us at Noble Elementary School for games, food and special events! ​Noble Road Presbyterian Church is hosting a free showing of this movie. How appropriate is this!! Enter through the Kirkwood Road side of the building. Residents are welcome to start their yard sale weekends this evening. Would you like to participate? Email us at NobleNeighbors@gmail.com with your street name. We'll put your street on our map. Christopher's Pub 1318 Warrensville Ctr. Rd. All over the neighborhood, residents are invited to offer yard sales at their homes or apartments. Look for the signs or use our printable and Google maps (maps will be available on this web page May 14.) Sale hosts choose their own hours. Would you like to host a sale? Email us at NobleNeighbors@gmail.com with your street name. We'll put your street on our map. Peace Lutheran Church's Baby Shop will give away baby items, toys, books, and A LOT of baby clothes (size nb-6x) starting at 9am. All items are free! From 11am-1pm, enjoy a free community cookout on the lawn. Learn about their FREE one week Christian day camp for children who have completed Kindergarten- 5th grade, June 10 14. Join us for fun at Denison Park! Kick it on the soccer field, learn to play pickleball on the tennis courts, shoot hoops on the basketball courts, fly the kite that you make, draw your art on the sidewalks with chalk. So many things to do! Check out Home Repair Resource Center's tool sale, and take the opportunity to tour the facilities and learn about their programs. Noble Road Presbyterian Church is hosting a rummage sale of household goods, a plant sale of perennials and vegetables, and a bake sale of goodies! The new home to the CHPD Community Response Team is having an open house and will show off their bike patrol team. Look for freebies for the kids! All over the neighborhood. Check out the map below. The Cleveland Heights Police Department will open the doors of the Martin G. Lentz Police Academy. Visitors can see the bomb squad, robots and other safety gear. The historic building, a former fire station, also includes police equipment and a history museum. Citizens Police Academy graduates will be on hand to talk about their role in the city. ​... Hold a yard sale? Great! we need sales all over the neighborhood to draw people in. 1. Send an email to NobleNeighbors@gmail.com with your yard sale address BY MAY 10 to get your street on our map. We'll map your street, but not your sale items - those details happen in the next step. 2. Go to GarageSaleFinder.com to list your address, date, time and sale items. This is really important! The more sales that are listed in one area, the greater the crowd we draw to all of them. 3. Make signs to direct people from the main road to your sale. Put them up for your sale, and take 'em down when it's done. Be creative with color and BIG THICK letters. 4. Print maps from our web page to hand out to your visitors. Help them find other sales and events. You can find the completed maps after May 15 at the bottom of this page. ​ ...Print a copy of the flyer so I can pass it out to my neighbors? Bravo! Thanks for encouraging others to participate. Some neighbors print one copy, write a hand-written message in the margin, then print many copies from this one to hand out. Some have encouraged others on the street to have yard sales, others encouraged folks to attend events. Maybe you could also suggest getting together for a block party this summer! Just click on the flyer image to the right and print the pdf file. First Tuesday of each month, 7pm, usually. We rotate where we meet between the public meeting places in the neighborhood. For three Saturdays - August 25, September 1 and 8, 2018, we launched a test market to see how much interest there is for neighbors to buy and sell home grown fruit, vegetables and flowers to each other. You can see more about the concept and our experience by clicking here. The response was tremendous! People came from all over the city and across city boundaries to be part of this hyper-local market. Participants were overwhelmingly people who want to buy from neighbors. If you grow food and flowers in your backyard or in community gardens, plan your 2019 garden so you have excess to sell! We need grower/sellers! While we'll refine our plans in the next few months, here's your sneak preview: the Noble Gardener's Market will be held on Saturday mornings July 20 - Sept 21, 2019. ​Next Meeting: May 5, 2019 and June 2, 2019, 3pm at Noble Library. Click here for reading preparation. You can now financially support Noble Neighbors and deduct your donation from your taxes thanks to our new partnership with FutureHeights. Make sure you designate Noble Neighbors in the drop-down menu. Checks need to be made out to FutureHeights with Noble Neighbors in the memo line. 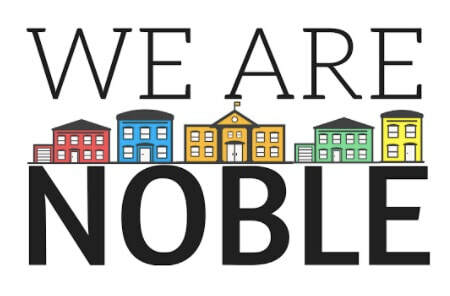 Checks and cash will be received at each Noble Neighbors meeting. On the first Thursday of every month, the police will be in our neighborhood to meet with us (and any other Cleveland Heights resident). On the other Thursdays, the police will return to City Hall where they have been meeting us for years. Let's take advantage of this! !